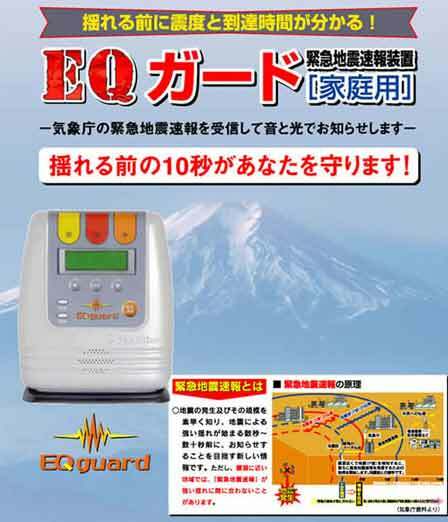 The EQ Guard from SunShine, a home security firm, uses the same information from Japan’s Meteorological Agency (JAMA) that indicates the onset of the primary waves that precede the destructive aspect of a quake. The book-sized box connects to the internet via a LAN cable to receive the data and sits anywhere residents can see or hear the alerts it broadcasts. The idea is that it can warn of an imminent earthquake up to 20 seconds in advance. This is enough time to seek shelter under a table, to turn off gas fittings or just to move away from precarious situations. Naturally, the length of the warning depends on the distance of the EQ Guard form the earthquake’s epicenter, but even a few seconds is better than no warning at all. Aside from the mobile service and that supplied through devices like the EQ Guard, JAMA’s earthquake alerts are also broadcast as text flashes on television and delivered to hospitals, factories and train operators so they can stop high-speed trains in an effort to avoid derailments.